Fellow blogger David L. Malhalab is reporting that the long vacant Comp USA at Ford Rd and the Southfield Freeway in the Warrendale neighborhood will become a Kaplan Career Center. 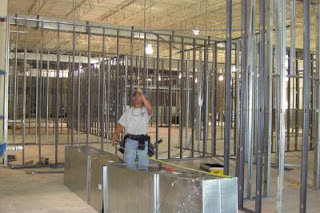 He was even kind enough to send me a photo of workers creating classrooms within the old CompUSA building. I wasn't able to reach anyone at Kaplan to confirm any of these details. However, Mr. Malbalab is reporting that the new center is expected to open in August of this year. I'm excited about these new jobs and economic activity coming to the Warrendale neighborhood. I also like the fact that, with Kaplan generating traffic in that section of the neighborhood, there is a greater chance that someone will be able to redevelop the former Office Depot location that is right next door.